We think that most orb photos are not paranormal in any way, however as digital camera technology develops we are seeing new types of orbs, not all having to do with the flash hitting dust particles or moisture drops. The photographic terms for this effect are backscatter and near-camera-reflection. 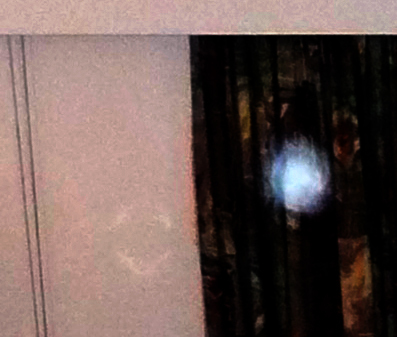 More about orbs in photos, and here's a recent blog post showing a large green orb. The baby is apparently looking straight at the orb. Can she see something we can't? Not in this case. 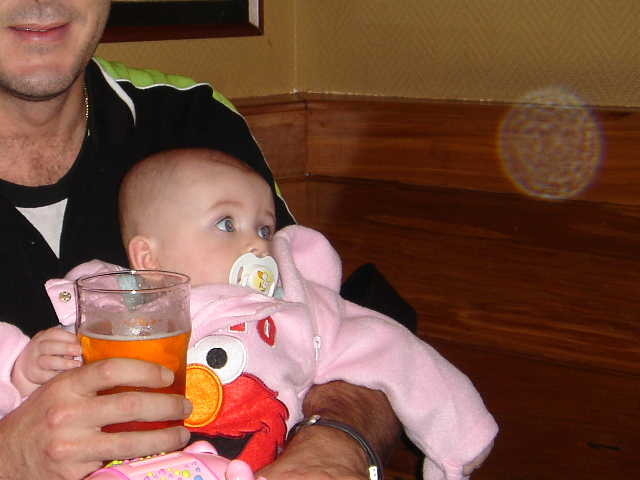 The orb is mere centimetres from the camera lens and the baby is looking at something else. This misleading sense of depth comes from the photograph rendering the three-dimensional world in two dimensions. There is no clue to depth regarding the orb, but we know it is small and close, not the size of an orange and metres away. sharpening, combined with lens imperfections, give it its texture. The camera's flash did not fire. 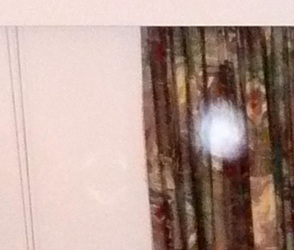 It shows that orbs can occur in photos without the need for the flash to fire. In this case, because the subject is strongly back- and top-lit, (see highlight on hair) it's probable that sunlight illuminated a floating piece of dust or drop of moisture that was close to the camera lens, but we don't know that for certain. It could be more closely related to lens flare. An orb caused by the evening sun? 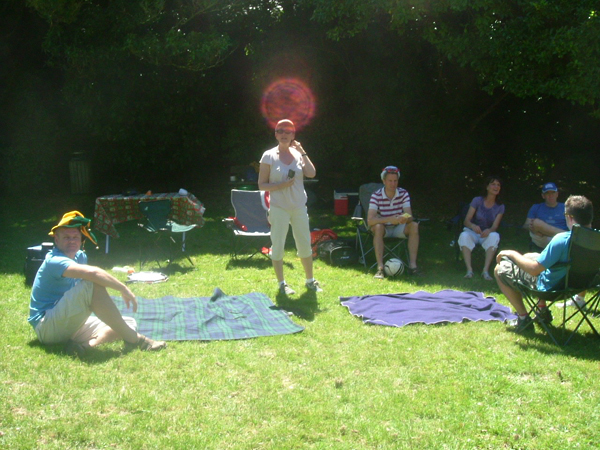 This orb is not caused by the camera flash, but by the sun. 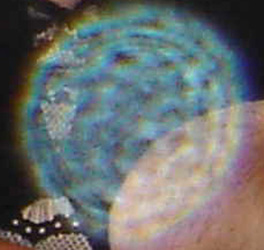 It's not a direct image of the sun (which is just out of frame) but a secondary image within the camera lens made by the sunlight shining in and bouncing around before arriving at the camera's sensor and forming an orb-like shape. 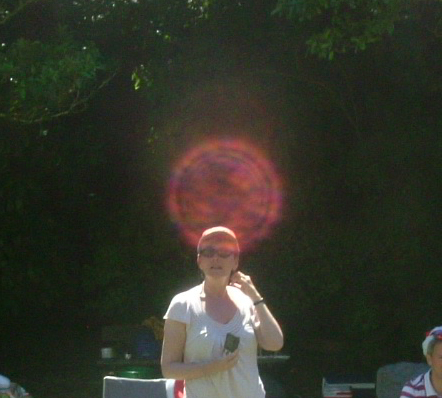 It perhaps falls more into the category of lens flare, but it is also a type of photographic orb. Its colour comes from the microscopically thin anti-glare coatings on the camera lens. If you have a similar coating on your eyeglasses, you can see that lights reflected in the lenses may be green, or some other colour. 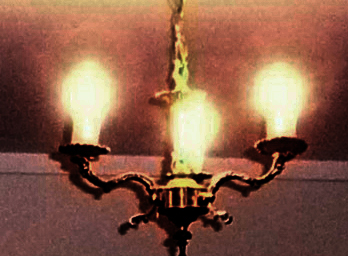 The colour has no spiritual significance and the orb is most probably a photographic anomaly and so is highly unlikely to be paranormal. 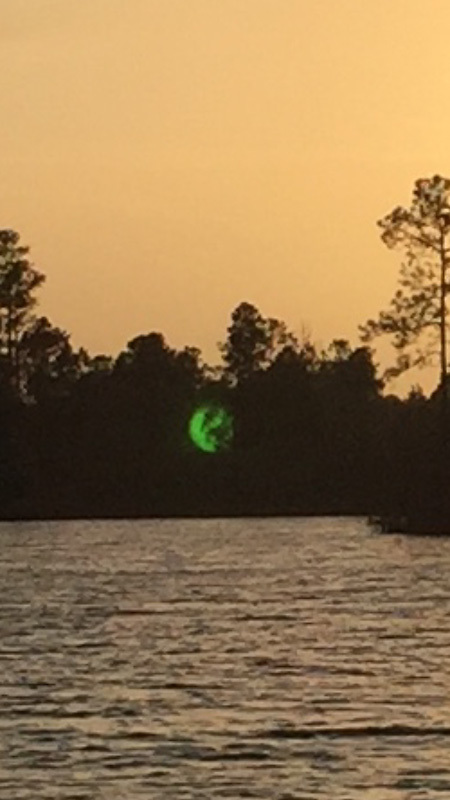 We can be fairly sure of this because other photos provided showed the sun in the frame and had similar green orbs more obviously caused by the sunlight. This photo, considered in isolation, is much more mysterious! 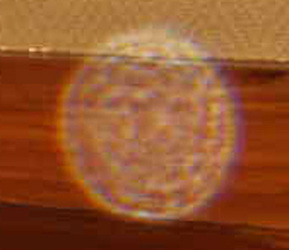 Close up of sun orb, 100% of original pixels. 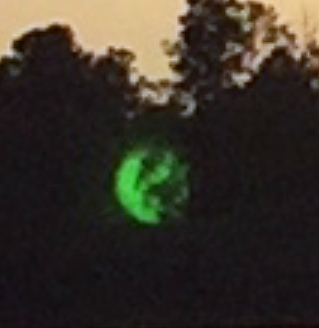 We're really not too sure why it look like part of the tree is in front of the orb! Mr Taylor - thank you for permission to use the photo. 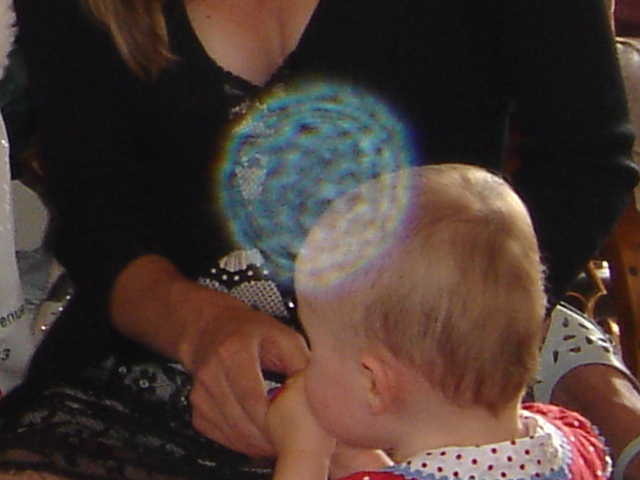 A different kind of orb - a vortex? 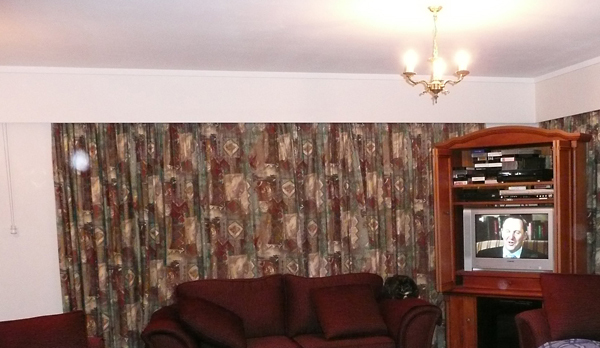 While this looks like yet another orb photograph, this orb has a different nature. It doesn't quite appear to be a dust orb, but is more likely a reflection inside the camera lens, creating a secondary image. Notice how the orb-thing is the same size and shape as the light bulb on the right? Also note there are a couple of regular dust orbs near the TV set, for a comparison. An interesting thing about this photo was that it was taken in response to a strong feeling of there being a presence in the house. The photographer had lost a close friend of the family that morning and was feeling that the person may have been in some way present in her house all day and perhaps trying to make contact. She felt strongly enough to attempt to speak to the presence, and then took the photo. This is exactly the right course of action to take. If you think there may be something strange occurring, take photos, make notes, look for possible natural causes and then contact our team or another trusted paranormal investigation group in your region. See What to do if you witness a paranormal event. Camera data: Panasonic DMC-TZ3, normal Program mode, shutter 1/30 second, aperture f3.3, zoom 4.3mm focal length, ISO640, flash fired, no red-eye reduction. 2232x1236 pixels, JPEG file.